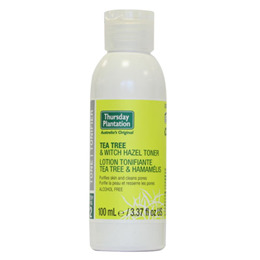 Thursday Plantation Tea Tree & Witch Hazel Toner captures the antibacterial power of Tea Tree Oil and the toning benefits of Witch Hazel to purify the skin and tighten pores. Gently tones and tightens pores without drying. Contains 100% pure Australian Tea Tree Oil, a natural antibacterial ingredient that removes excessive oil and bacteria from the skin. 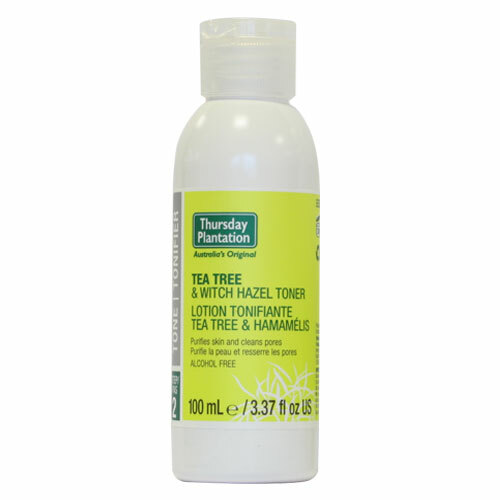 Contains Witch Hazel, a natural astringent that tightens pores and improves the skin appearance. Contains naturally derived ingredients. Alcohol-free to maintain the skin pH balance. Aqua / Water, Hamamelis Virginiana (Witch Hazel) Water, Polysorbate 20, Sodium PCA, Glycerin, Sorbitol, Melaleuca Alternifolia (Tea Tree) Leaf Oil, Lactic Acid, Potassium Sorbate, Sodium Lactate, Allantoin, Lavandula Angustifolia (Lavender) Oil, Aloe Barbadensis Leaf Juice Powder, Limonene, Linalool. Dispense a small amount onto a cotton pad and gently wipe over face after cleansing or wearing makeup. If sensitivity occurs, discontinue use. Below are reviews of Thursday Plantation Tea Tree & Witch Hazel Toner - 100ml by bodykind customers. If you have tried this product we'd love to hear what you think so please leave a review.